Well... I guess I’m happy generally isn’t the same as never. He’s a junior. This is not some freshman we are talking about. Sooner or later we may have to come to grips that he is a solid player who is never going to reach his full potential at Nebraska. Part of that may be due to him having to play the 5 due to Miles inability to recruit an inside presence. Agree on Roby. I hope he doesn’t someday look back and wonder “what if.” One thing I believe - he and Watson would run through a brick wall for this program. They are dream teammates. Speaking of Jordy leaving high and dry... don’t get me started about his little stunt showing up in Lincoln last month. Get the hell out of here with that. You totally screwed this program with your brother running the show for his fantasy nba dream. Welcome to the bubble- just a horrible loss. Will be plenty of time to get back off of it but as of tonight we just aren’t playing good basketball. Maybe Heiman can put on 40 lbs in the off-season. *sigh* Not sure tonight is the best night to post my thoughts. But what the heck, I will anyway. So the pragmatist in me is trying to take a macro view of this situation. Listen, its not like we're playing for a big ten title, or trying to make the final four. We just need to win an NCAA tournament game. Until we do that, that is our glass ceiling. With that said, the road losses this year, games we could have/should have won, I think speaks to a larger issue with either this team or the program as a whole. This Senior laden team, Mile's best team in his tenure here, seems to be awfully mentally soft on the road. Sooner or later we may have to come to grips that he is a solid player who is never going to reach his full potential at Nebraska. Unfortunately this is a common theme for players here. a lot of people see only stats, and dont watch the game to see the context for those numbers. unfortunate reality. Happens in this age of stat analytics. I don't mind stats but you have to be holistic. To be fair that Indiana team has lost 4 straight and isn't that impressive of a win as it stands now. Dererk Pardon is playing 30 minutes a game as a center in this league so physically there is no reason why Roby can't and given his ability being guarded by a traditional 5 should be an advantage for him offensively. Doing something that hasn't been done before is rarely easy. Of course this is technically a bad loss and in reality is a bad loss. 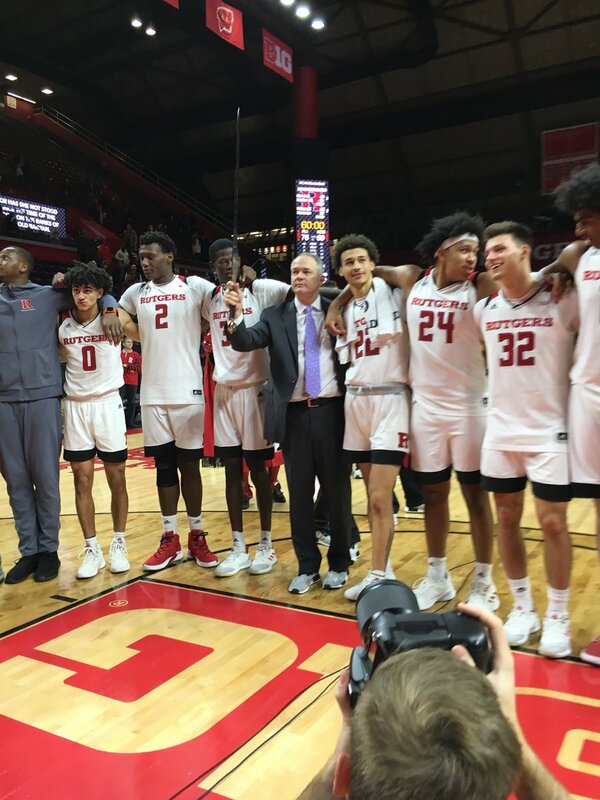 Rutgers hasn't been playing well and our calling card of defense failed us. I fear Miles is close to losing this team if we don't take advantage of this next 7 game stretch. Leadership from the players is lacking and body language is saying a lot from my perspective. Thomas Allen struggled tonight and he has the look of someone who will be transferring imho. I﻿ can﻿﻿﻿﻿﻿﻿﻿﻿﻿﻿ still see 22-﻿﻿23 wins﻿. Every game is now huge. The thing is... every game was (or should have been) huge. We need to play like we have something to prove. Because we do. We don’t get the opportunity to be lackadaisical. We haven’t earned that yet. Ideally it would be making a tournament AND winning a game. I know that’s not realistic and that if he makes the tournament he is not getting fired. But, if we do make the tournament and lose first round next year doesn’t look great on paper and we will be in the same predicament I’m afraid.